GTC Smartach+ wireless ignition analyzer and tachometer 's unique and proprietary technology allows the user to perform quick and reliable diagnostics of non-starts, misfires, fouled up or damaged spark plugs and/or spark plug wires, by comparing digital read-outs of the spark plug voltage between cylinders on engines using conventional distributor/ignition coil, DIS (Distributor-less) or waste spark and magneto technologies. 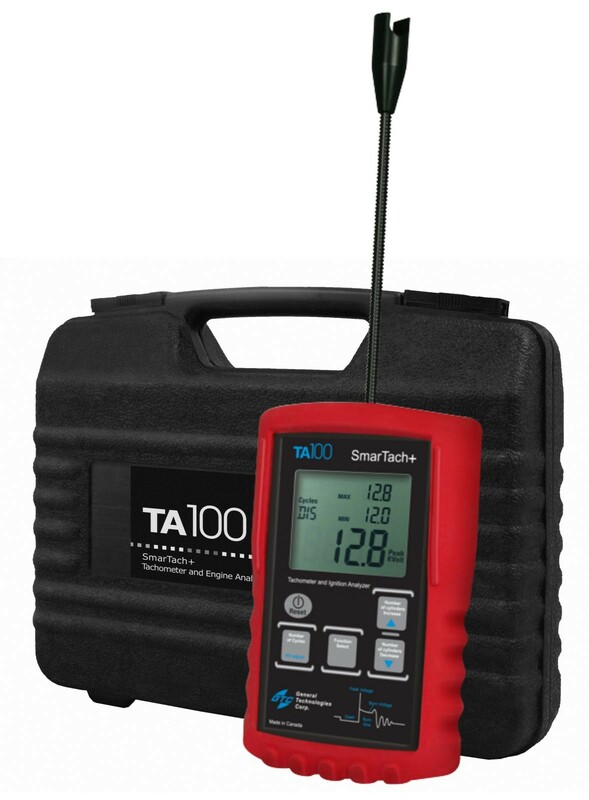 The TA100’s unique and proprietary technology allows the user to perform quick and reliable diagnostics of non-starts, misfires, fouled up or damaged spark plugs and/or spark plug wires, by comparing digital read-outs of the spark plug voltage between cylinders on engines using conventional distributor/ignition coil, DIS (Distributor-less) or waste spark and magneto technologies. Place the antenna's capacitive sensor on a spark plug wire or coil. Peak voltage of the ignition pulse in kilovolts is displayed. Adjustable KV scale: allows the user to trim the KV reading scale, to match other instrument or a know value. Tachometer: Set the number of cylinders and cycles, either place the capacitive sensor on a spark plug wire, or hold the instrument's antenna near the ignition system. RPM is displayed. Minimum and Maximum display: Two secondary displays show in real time the maximum and minimum readings. No sighting of rotating parts or hook-up required.